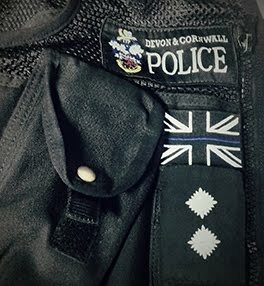 Inspector blogging: Would you believe it! Whilst I am still in the mood to “swing the lamp” I thought I would share just one more story from days gone by. This one is not mine but my colleague swears up and down that it is true. It all happened in a distant police force where many of the officers still have British accents but the weather is much warmer. A frighteningly keen officer whom we shall call “Rich Tea” was on foot patrol one night. It was a dark warm night and it was in that part of town where the street lights and made up roads give way to darkness and dirt tracks. Rich Tea saw two men, dressed in flip flops and colourful shirts turn down a deserted, dead end side road. He decided to follow them. (I interrupted the original story teller here to see if our hero had anything more than a radio and if it was in the days before stab vests were worn. He did and it was.) The two men stopped a short distance ahead and Rich Tea hid in the bushes to keep observations on the pair. After a muffled conversation, the exchange of something and some fist bumping and back slapping they went and got into a nearby car. As the car turned and started to head out of the side road our man stepped out of the shadows and with a crisp number one stop sign brought the car to a standstill. Rich Tea walked round to the driver’s door, opened it, smelt alcohol and then told the driver to get out of the car because he was being arrested on suspicion of driving a car whilst incapable through alcohol. I was surprised for the second time in the story to hear that the driver, and his friend did actually get out of the car. Events followed the natural course of things. The driver and his friend started to beat the living daylights out of Rich Tea. Just before Rich Tea fell into unconsciousness he heard a conversation about whether to cut his eyes out to stop him identifying his attackers at a later date. Apparently a passing taxi driver stopped to help; help Rich Tea that is, not the two attackers. He persuaded the two that the sorry looking bundle on the floor had had enough and that they should leave. They did. Rich tea woke the next day still with his eyes in his sockets. The two were known to the taxi driver and quickly located and arrested. There was no forensic evidence tying them to the scene. No knife was found but one of them had a decent stash of drugs in his car. But with an eye witness and a damming collection of previous convictions they were remanded in custody by the police and at the bail hearing. Simples. A trial date was set. Rich Tea’s bumps and lumps started to heal and he felt confident. The taxi driver withdrew his statement. Rich Tea’s bruises had started to fade and he felt less confident. On the day of the trial Rich Tea discovered the defendants had secured the services of a defence barrister known as “The Beast”. Rich Tea was the picture of health and was nervous. Rich Tea took to the stand and the prosecution guided him through a re-telling of his story, sparing none of the colourful details. Then The Beast stood. The exchange between The Beast and Rich Tea, I am told went like this. Rich Tea can be seen to sink up to his chest in the evidence box in the manner of a bad mime artist doing the comedy elevator move. (Rich Tea can be seen by the whole court, chin level with the top of the witness box, to be reaching for something in his back pocket whilst keeping his eyes fixed directly ahead). Rapidly following this answer Rich Tea pointed with his left hand at something in front of him, exclaiming “What’s that?” At the same moment he threw a police issue pocket notebook behind him out of the witness box. The Beast didn’t get to ask any more questions. Rich Tea, in a magnificently John Cleese turn of events swooned in the witness box and collapsed dramatically on the floor. He could not be roused from his “feint” until well clear of the courtroom. I did not find out what happened to Rich Tea. PS - please drive safely, be kind, respect property. PPS - there was an armed robbery in Truro a few days ago. Our thoughts and support go out to those affected. Baddies have been caught. Hello Home Inspection Tampa. I'm not sure we are the same type of "Inspector", but it's lovely to hear from you. I am so hoping you are not an internet word searching robot!